VAT has been a hot topic in recent months after its implementation in UAE. It is a unified indirect tax system and governments implement it on the supply of goods and services for all the people started from manufacturers to the consumers. The basic purpose of VAT is to make complex tax web simple and understandable. The experts give it a name of all-inclusive tax because it helps the governments incorporate all the citizens under tax net. As VAT is collected on numerous levels and therefore, the taxpayer must file VAT returns documents in front of the tax authorities. Under VAT reforms, tax both on purchase and on sales is included and you need to calculate the difference between both. The businesses file VAT returns in a specific format given by the governments. They need to submit these returns on a monthly, quarterly and annual basis according to business type. Therefore, businesses consider it a tedious task and are trying to find a solution. To resolve all these issues related to VAT tax returns filing, you need VAT-ready ERP solutions and the best one among them all is Sage 300 ERP in Dubai. It is fully VAT-ready ERP software in the UAE and helps you assist companies stay VAT compliant. 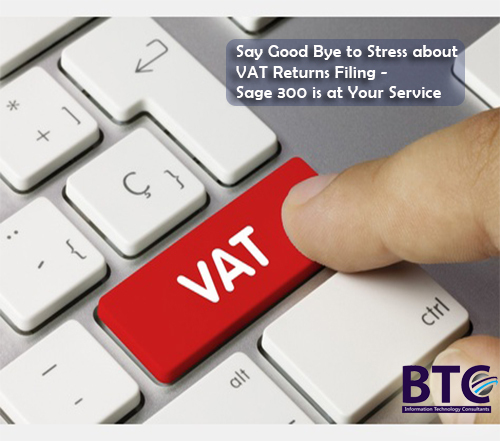 Sage 300 ERP provides you the entire process of filing VAT tax returns. It handles all types of tax returns to make your life easier and your business compatible. You are just a click away if you have followed the instructions given while providing the information to the system. Against your instructions to the system to generate VAT tax returns files, it generates an output in the form of a CSV report in which all the data you provided is available. You will find the transaction type and details, customer information, tax rate, amount and many other items on the report you require. Customization is also available in Sage 300’s VAT module and the end users can manage both types of data, whether it is VAT on purchase or sales. Sage 300 ERP in Dubai provides you the option to automate the whole system of VAT and make your organization VAT compliant. The incorporation of Sage 300 ERP will pace up the process and you will come out all of the worries related to VAT returns. To make your business VAT ready for your Sage 300 accounting solution, BTC with its diverse knowledge and experience in offering taxation solutions, introduces VAT add-on for Sage 300. This unique add-on will configure your Sage 300 ERP with the statutory tax rules and accounting systems making it compliant, thereby driving a seamless transit into the VAT era. A strategic decision-making ability around business structures ensuring efficiency, understanding reputational risks. Easy management of operational challenges on transactions, cash flow management, tax credits, payments, refunds and accounting periods. Businesses can gain extended reporting features based on the requirements on VAT declarations, tax authority audits. It is a robust ERP software that can be useful for all types of businesses and organizations, which need to reach at VAT compliance level. If you will engage VAT-ready software like Sage 300 ERP in your organization right now, you can win long term benefits of being VAT compliant business. How Can ERP Help Your Business Grow?